Hello In There was released in 1983 on Columbia Records. Hello in There is less a concession to country radio than its predecessor, Castles in the Sand, released earlier in 1983. It’s a wilder, in some senses less focused record, but no less compelling a listen. 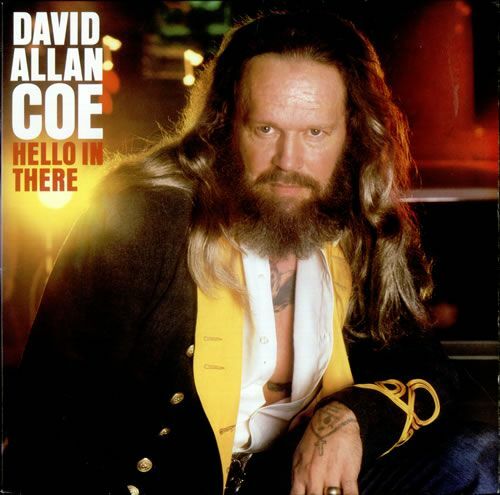 Dividing the album into two sections, a country side and a city side, David Allan Coe explores the rocking side of country and the country side of rock conversely. Coe wrote only four tunes on the album, but his interpretive singing is so idiosyncratic and authoritative he makes the covers his own. The set opens with Paul Kennerly’s honky tonk reverie “Crazy Old Soldier,” which juxtaposes regret, defiance, acceptance, and resignation. “Out of Your Mind” is one Coe’s better broken love songs and “Drinkin’ to Forget” is the other side of the equation. The title track, written by John Prine, feels strange being on the “city side” of the record, but Coe’s version is wonderful. He turns the lyric inward, like a reflection in a mirror. “For Lovers Only, Pt. 2” is the sequel to a tune with the same name on Castles in the Sand. Coe comes off as if he is writing the song during its recording, and though gimmicky, it works. There is an immediacy and warmth that carries it to the listener whole. The album closes with “I Ain’t Gonna Let You Go Again,” a rollicking outlaw country tune with stomping guitar by Warren Haynes. Once more there is evidence that Coe’s entire period with Columbia and his partnership with Billy Sherrill resulted in consistently high-level work despite the fact that Nashville was changing around him and his trademark brand of restless yet utterly faithful country music was being squeezed from the picture.